As anyone who regularly reads Milespaddled.com would know, we love the Waupaca area for canoeing and kayaking. There’s an appeal there that we just can’t resist, and the Crystal River is one of those reasons. It’s a river that’s wonderful for paddlers of any skill type – perfect for beginners getting their feet wet to river paddling for the first time – nevermind that the river is as crystal clear as the name suggests, absolutely gorgeous and fun. 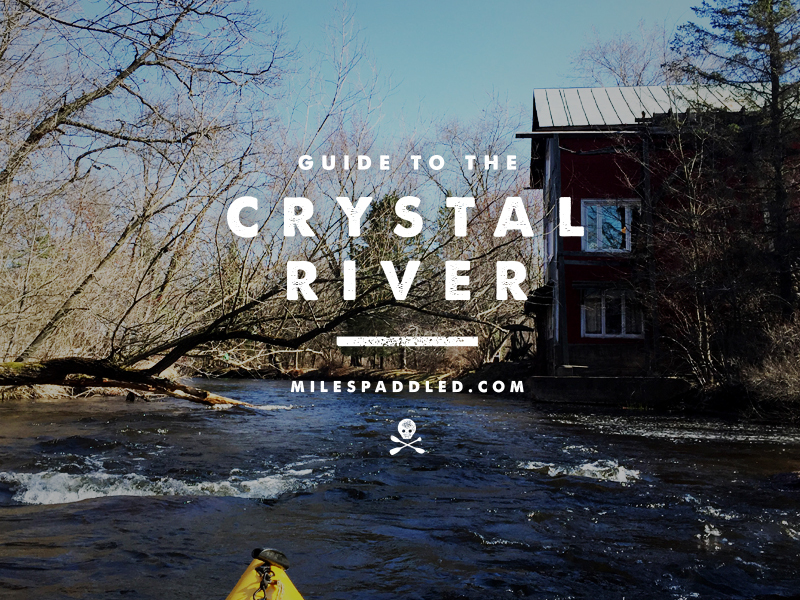 Separately, all three of the sections below are short, and in fact, the entire twelve mile stretch of the paddleable Crystal could be paddled in one long day paddle. Most people, however, just paddle the section from Rural to Peter Nelson Park in Little Hope or just beyond that to Shadow Lake Road (paddling to Shadow Lake Road affords you the short enjoyment of paddling beneath the red covered bridge behind the Red Mill, as well as grab the last few riffles the river has to offer). While it’s seriously short on length, it’s big on diversity and it’s just so damn fun from start to finish. From Marl Lake to bigger lakes, riffly headwaters, through a cute little town with manicured landscapes, then drops, ledges, prairie paddling, a covered bridge, more flatwater, then back to lake, it has practically everything a paddler could want in a paltry dozen miles. To paddle the headwaters of the Crystal, one must do some lake paddling – there’s no way around it. There are a couple access points, but none more appealing than the allure of starting at Marl Lake, an absolutely gorgeous (albeit small) lake which itself is the blue-ish green color that one is more apt to find in the Caribbean or the beaches of Cancun – not in Waupaca of all places. The downside (or consideration) to paddling the lake section is wind (or those who just don’t like paddling lakes, I suppose) as the final stretch on Long Lake is just that… Long… But once you meet the headwaters, you’re immediately treated to what makes the Crystal so appealing – crystal-clear water, strewn boulders and numerous delightful riffles. The actual headwaters reside in the back half of this trip – it really is more lake paddling than anything – but if you’ve done the rest of the Crystal, this is well worth adding to your list since you’ve probably become as smitten with this creek-like river the way we are. Once you get to the quaint town of Rural, you could easily take-out there but you might as well continue on because the next section is what draws people to this river. This is the most popular section of the Crystal because of the variety of riches it beholds for the casual paddler (and also because Ding’s Dock, a local outfitter, services it). You’ll find easy access in the charming town of Rural. From there you’ll discovery a variety of features; narrow creek-like passages through backyards and under cute bridges, some elegant open water, back to riffly bends, one easy Class I drop, followed by a few little ledges and then even more riffles until it becomes a quieter prairie-paddle through what was once much different. You see, the Crystal River is one of a handful of water trails that we’ve paddled where the surroundings/appearance changed noticeably quicker than others – due to time, but mostly due to the removal of a dam. Where there was once a millpond, the dam has been removed, so now it finds itself receding back to its natural state, which for paddlers, makes for a less slog-like paddle through the former millpond section, and a more interesting paddle that leads all the way to the take-out. If you use Ding’s Dock as an outfitter, you’ll use their take-out point, which is located well before the former millpond, thereby cutting your trip even shorter than you’ll probably want it to be. Otherwise, if left to your own devices, you’ll paddle to the convenient access point near the Red Mill in Little Hope and take-out at Peter Nelson Park. One could (and should) paddle to Shadow Lake Road if you still have an appetite for more Crystal (and the covered bridge) although it’s just a bridge-side take-out (but still convenient). This great beginner section starts at Nelson Park. From here, you’ll find a bit fun, starting with paddling below the red covered bridge behind the Red Mill. Then, there’s a few more riffles that lead past the shooting range (Duck! Or be loud, I guess?) and continue past Shadow Lake Road. From there to the Highway, it’s pleasant and calm without much of what makes the Crystal unique upstream, but there’s nothing wrong with an uneventful section on a river this pretty. Before the Crystal veers northeast towards Cary Pond (a stagnant millpond with no access points for paddlers) and then eventually the Waupaca, it’s best to detour river-left and take-out at Shadow Lake. You’ll find a sign with directions towards a narrow marked passage which leads you towards Shadow Lake just after Highway 10 where a short jaunt across the lake leads to a nice boat landing with plenty of parking.